Convention week lends itself to a certain amount of political nostalgia - and not just about political conventions (an acquired taste at best). So I've devoted of the late-night time I might otherwise have spent convention-watching to read William Lee Miller's, Two Americans: Truman, Eisenhower, and a Dangerous World (Knopf, 2012) - an inspiring escape from our current uninspiring politics. Harry S Truman (1884-1972) and Dwight D. Eisenhower (1890-1969) were respectively the 33rd and 34th presidents of the United States, occupying the White House from April 12, 1945 to January 20, 1961, years of enormous importance in modern American and world history. While each man would occupy a place at the pinnacle of world events (Eisenhower as Allied Supreme Commander in World War II as well as President later), both came from modest, small-town American backgrounds - the kind of backgrounds our political culture easily romanticizes but which in this case really did pay off for the country in making them the men they were. Bookended in the White House by old-money aristocrat FDR and new money aristocrat JFK, Truman and Eisenhower really did represent the American "common man." Truman was the last president never to have attended college (which I well remember was part of his appeal to my father). Neither owned his own house until after his presidency. Truman was probably the poorest 20th century president. Eishenhower did better but would hardly have counted as rich - something to think about, now that we just routinely take it for granted that our presidents will be millionares. Both had what Miller calls "a straightforward, uncomplicated patriotism." Both enormously admired General George Marshall, and both saw through General Douglas Mac Arthur. Both got to the top by combinations of circumstances harldy anyone would have earlier predicted, and both made the most of their prominence through the double firestorm of war and Cold War, helping to create a framework for peace and unparalleled prosperity. Miller treats their separate life paths from obscurity to pre-eminence, how their paths unexpectedly intersected at the close of World War II, how they collaborated in creating the post-war world, and their subsequent political rivalry. Unfortunately, the book does have a few factual errors. The Soviet Union did not enter the war against Japan on August 15. The 1960 summit was not in Geneva. JFK's funeral was not at Washington's National Cahtedral. At best, whenever in a book I encounter those kinds of errors concerning facts I know about, it's an unnecessary distraction. at worst, it makes me wonder what other errors there may be in matters I don't know about and am relying on the author to inform me of! That said, all in all, the book combines engaging biography and genuine historical insight about a fascinating time and the pivotal part these two true leaders played. Of course, as with all real people, there was more to each man's story than his genuine down-to-earth American modesty and his high moral stature. Each had his limitations and faults. And no account could fail to record their famous 1950s feud. Miller quotes an observation by British MP Roy Jenkins, commenting on the (in)famous January 20, 1953, transition from Truman to Eisenhower. Jenkins remarked on "the unfortunate picture of two gnetlemen in their sixties, both outstanding servants of the greatest democracy in the world, behaving in a way which would have been discreditable to two small boys of eight." Did their feud and petulant behavior toward each other stand out all the more because our standards were higher then? Would one's reaction be the same today, when, on the one hand, boorish behavior in public is increasingly the norm, and, on the other, comparably "outstanding servants of the greatest democracy in the world" would be hard, if not impossible, to locate? Truman and Ike famously reconciled at JFK's funeral. Something about being confronted by our common mortality maybe? I studiously avoided tuning in to the antics in Tampa until about 10:30 last night, when I turned on my TV to hear NJ Governor Chris Christie's keynote. In so doing, I was probably motivated in part by a certain degree of fat solidarity. After all, the two main bigotries that are currently still fashionable in our enlightened society are those against fat people and against Christians, and I obviously identify myself with both groups. In any event, keynote speeches are, generally speaking, more likely to be interesting than most other convention blather, and the chosen speaker is very often seen as someone with a serious future, someone worth taking a look at. For what it was, I thought the speech was fairly good. The fact that he spoke so much about himself and his family story confirmed that the speech was more about him than about his party's standard-bearer - more about future elections than the current campaign. As a fellow Sicilian, I could certainly appreciate and relish his family story. I can still remember and relate to a world which, as Christie recalled, couldn't afford foolishness and valued truth-telling - "bluntly, directly, and without much varnish." And I also appreciated the lesson Christie says he got form his mother that, if the choice is between being loved and being respected, go with being respected and don't let yourself get paralyzed (as Christie believes we have become) by the desire to be loved. That's a message anyone in public life should be able to relate to and should seriously take to heart. There are problems with that message, however. Some of the news coverage seems to suggest that Christie may have inadvertently stepped on Anne Romney's message, which was apparently all about love. I didn't watch her speech, but surely one would expect a candidate's wife to love her husband and talk about him that way. Maybe we should be less obsessed with our politicians' domestic lives and how lovable they actually are. but it's really hard to fault a spouse to speaking that way. No, the real problem as I see it is that Christie's candidate's campaign has hardly been characterized by the qualities Christie chose last night to extol. According to Christie, "we must lead the way our citizens live. To lead as my mother inisted I live, not by avoiding truths, especially the hard ones, but by facing up to them and being the better for it." That sounds more like Christie's own understanding of himself and his personal take on how he has governed NJ. It's hard to imagine, however, in what parallel universe that could begin to describe his party's candidate's quest for the presidency - a campaign in which he has disowned his own greatest political accomplishments and previous beliefs, in the process pandering to those who hold totally opposite positions. And that's not even to mention his ads about welfare and work and his pandering to birtherism! And what about his belief "in telling hard working families the truth about our country's fiscal realities. Telling them what they already know - the math of federal spending doesn't add up"? How about telling them who it was the busted the budget and blew away the surplus Bill Clinton left his successor? How about adding up the math of the Vice Presidential candidate's supposedly bold budget plan? All in all, it is really hard to escape the impression that this speech was probably a lot more about the next campaign than about this one - about some other candidate than about the present one. I admit that I've obviously enjoyed watching The Newsroom, although perhaps in the way most of us enjoy news stories we would all admit are not what we really believe news should be about! Now that the show's first season is over, however, one can aspire to assume appropriate critical distance! As a drama, The Newsroom runs on two major tracks. The first is the political journalism track, in which the anchor, Will McAvoy, and his staff - with a self-righteousness rivalled only by the Tea Partiers they so despise - promote a highbrow approach to journalism. Sadly this often seems to be little more than a vehicle for McAvoy to express his political prejudices with an intensity matched only by his personal self-absorption. The second track (somewhat more easy for most normal folks to connect with) is the relationship track. There is the on-going soap opera of Will and MacKenzie, which goes on and on at great personal cost to both and in the end sort of leaves one wondering why anyone would ever like (let alone love) either of them. Much more sympathetic are the younger characters - Maggie, Don, and Jim - caught up in their seeminly inescapable love triangle. Don's actually not such a bad guy, but I at least found myself rooting for Maggie to dump him for Jim. That looked as if it might at last actually happen in the final episode, but Don won Maggie by "committing" to her. That is, he asked her to move in with him - and gave her a key to his apartment. Is a key the post-modern version of a ring? That's not an absolutely outside-the-box question, since Sloan Sabbith, the sadly single economic reporter explicity told Don earlier in that episode that she would regard a propposal of marriage as the true sign of someone's commitment. Apparently, marriage is just way beyond Don's imagination - or Maggie's expectations. (Sloan's belief in marriage might help explain her unfortunate singleness at least as much as her supposedly off-putting intellectualism and her supposed social awkwardness.) Meanwhile, Maggie's and Don's continuance as a couple seems to leave Jim stuck in an even more incongruous relationship with Lisa. Even if Hurricane Isaac hadn’t pre-empted it, I doubt I would have clicked my TV remote tonight to the start of this week’s political commercial in Tampa. There was once a time, however, when I would have looked at it very differently – back when a convention’s outcome was not always foreordained and when actual news was being made in and around the convention hall. My earliest convention memory is seeing President Eisenhower standing in his open car being adulated by the crowds as he arrived at the 1956 convention in Chicago. Of either party’s actual convention that year (which I was undoubtedly still too young to stay up to watch), I recall nothing. 1960, however, was another story entirely. Nixon’s nomination by the Republicans was already really wrapped up (although some real news was still made at that convention). The big story that year was the Democratic Convention in LA at which JFK arrived a front-runner but not yet a winner. I remember the caucus “debate” between him and LBJ, the wild “spontaneous demonstration” for Adlai Stevenson, watching Wyoming casting the decisive vote during the roll call, Kennedy’s impromptu unofficial acceptance that night, and his formal acceptance speech later at which the “New Frontier” was introduced. Night fell big-time on the Democrats in 1968, however. I had been distracted during the rather boring Republican Convention by the death and funeral of a friend, but was riveted (like much of the country) by the televised images of the chaotic and violent Democratic Convention, at which the old New Deal coalition quite visibly unraveled for all to see. 1968 was also, I believe, the last time the Democratic standard bearer was nominated without having competed in a single primary. Four years later, the new McGovern rules had effectively replaced the old blue-collar base of the party with the collage of interest groups that still dominate and control it – with predictable consequences. That week I went to party at a friend’s lower East Side apartment to celebrate McGovern’s nomination – a celebration famously delayed until an unconscionably late hour by the delegates’ amazingly self-indulgent carrying on. McGovern’s nomination had actually been sealed already by his victory in the California primary – perhaps the last time that late primary played a decisive role in a campaign. 1976 saw the down-to-the-wire fight between President Gerald Ford and challenger Ronald Reagan and the latter’s memorable speech detracting from Ford’s ostensible victory. The Democrats nominated Jimmy Carter – an “outsider” who actually bragged he had never met a Democratic President – and ended the convention with a Martin Luther King, Sr., love-feast. Four years later, however, having lost his challenge to Carter, Ted Kennedy gave the most memorable speech of the convention and then notably avoided linking arms with Carter – a gesture of support Carter clearly desired and needed. The Republicans meanwhile followed their hearts and finally nominated Regan. After that, conventions quickly became less and less relevant – and a lot less interesting. By the 1992 conventions, the Democrats had solidified their identity as the abortion party and the Republicans as the “culture war” party. Bill Clinton celebrated his win with Fleetwood Mack in 1992; Al Gore danced with and kissed tipper in 2000; and Barack Obama gave a classy acceptance speech in 2008. But by then it was all for show. No one now expects a convention actually to decide anything anymore. And, if the candidates and their handlers are successful, no non-weather-related news will be made there either. Obviously, a very good lesson for any popular politician to bear in mind! Jesus, of course, was not a politician in any conventional sense. Nonetheless, the Gospel story of the miraculous feeding of the 5000 suggests how he would have fared in the approval ratings. Backtracking through 5 weeks of Sunday Gospel accounts to that amazing miracle, we recall that the delighted crowd responded initially by attempting to acclaim Jesus as their king – a dubious honor perhaps, given the perilous political situation in Israel at that time, but certainly a good barometer of the esteem in which Jesus was held, thanks to his demonstrated prowess as a miracle worker. Since then, however, like a modern news audience tracking a candidate’s declining poll numbers, we have watched the steady decline of Jesus’ popularity, as he proceeded to tell his audience things they really didn’t want to hear. Such is, of course, the inevitable danger any public figure faces! In Jesus’ case, the cheering stopped as it began to become apparent that the miraculous feeding of the 5000 was not just an entertaining interruption in life’s regular routine, or a ticket to a lifetime of free lunches, but rather a challenge to reorient one’s entire life in relation to something more permanent. Strong language to be sure – a bit too strong for his hearers’ tastes! Jesus’ words turned off many of his hearers; and the Gospel account allows us to listen in on this drama of division and discord which Jesus’ tough talk has caused – as a result of which many of his disciples returned to their former way of life and no longer accompanied him. Centuries earlier, something similar had transpired when the Israelites had gathered with Joshua at Shechem [Joshua 24]. When challenged by Joshua, the people answered, reflecting on what they had learned about God in their own experience as a people - how he had brought them up out of slavery, how he had performed great miracles, and how he had protected them along their entire journey. What was anticipated in Israel’s experience was finally fulfilled in Jesus, the point of whose life is God’s identification of himself with us - God’s personal experience of human existence from the inside, from our side. So, if we are truly to encounter God and find life for our world, then we must recognize the human ways in which God has chosen to encounter us – as Joshua challenged the people to recognize in the experience of Israel, as Paul challenged the Ephesians to recognize in the sacrament of Christian marriage [Ephesians 5:21-32], as Jesus challenged the 12 to recognize in himself. In answering on behalf of the 12, in his role as spokesman for the entire Church, Peter professed the foundational faith of the Church and highlighted for us just what our personal stance toward Jesus should be. It is widely noted how nowadays most Catholics receive Communion at Mass (a virtually unprecedented state of affairs historically). But that really should just push the question to the next level. Just how total, how transformational, is our unique Eucharistic encounter with the Risen Lord, the Word of eternal life? Is Jesus just one option among many? Or have we too come to believe and be convinced that he is the one and only one to go to. Just as Peter had to answer the question whether to stay or to leave and why, so too must we – today and every day. What does it really mean here and now for us to stay? Homily for the 21st Sunday in Ordinary Time, Immaculate Conception Church, Knoxville, TN, August 26, 2012. Since 2004, St. Thomas More has officially been the patron saint of statesmen. But, long before Thomas More, there were statesman saints, holy medieval kings and queens honored in the Church’s calendar – St. Wenceslaus, Duke of Bohemia (c.907-929), St. Henry II, Holy Roman Emperor (972-1024), St. Stephen, Apostolic King of Hungary (969-1038), St. Edward the Confessor, King of England (1003-1066), St. Margaret, Queen of Scotland (c.1045-1093), St. Elizabeth, Queen of Portugal (1271-1336), and the most famous medieval ruler of them all, St. Louis IX, King of France (1214-1270), whom the Church commemorates today. Louis IX’s mother, Blanche of Castile is supposed to have told him, "I would rather see you dead at my feet than guilty of a mortal sin.” Apparently, he took his mother’s admonition very much to heart! Upon his canonization in 1297, so strong was popular devotion to St. Louis IX that the introduction of his feast bumped the Apostle St. Bartholomew to the previous day! In Munich in January 1919 (when Central and Eastern Europe was quite literally coming apart, thanks to that absurd failure of statesmanship that was World War I), the German sociologist Max Weber (1864-1920) gave his famous lecture Politik als Beruf (“Politics As a Vocation”), which eventually became a must read for serious 20th-century students of politics and its ethical challenges. Long before Weber, however, St. Louis IX and other saintly medieval kings and queens had lived out politics as a vocation in the fullest sense, incorporating their political calling within the universal vocation to holiness. Nor was the vocation to holiness in political life confined to the Middle Ages. Consider the case of Weber’s contemporary, Blessed Kaiser Karl I (1887-1922), who reigned as Austrian Emperor and Apostolic King of Hungary from 1916 until he was tragically deposed as one of World War I’s losers in 1918. If nothing else, that certainly sounds a lot better than the platform of either party in the present election! When I arrived at the Paulist Novitiate in Oak Ridge, NJ, 31 years ago yesterday, maintaining and repairing buildings had to be among the farthest things from my mind. Obviously, I understood that buildings are essential to carrying out the Church’s mission, and that good stewardship of church property is inevitably part of the job of any priest who is fortunate enough to serve as a pastor of a parish. But, in the same way that a newly married couple starting a family understands that repairing and maintaining their home will be part of their family life but it is hardly their primary purpose or focus, so too I doubt that anyone becomes a priest primarily to take care of property. (Indeed – and this is something for which seminary formation should probably be faulted – there is almost no attention to any such matters at all as part of preparation for ordination). Now that I am a pastor, however, the replacement of my parish church’s roof, which suffered storm damage in 2011, is one of my major pending projects. So last fall we decided to proceed with its replacement. A separate, but long pending concern has been the need to replace the ceiling under the roof inside the church. This too was discussed for much of last year. The general consensus was that we should replace the inside ceiling as soon as the new roof was in place. Because the replacement of the ceiling will significantly disrupt our use of the church, plans were made to begin and end that work this September to avoid adversely impacting parish activities during the major seasons of the liturgical year. I had originally hoped the roof work would begin in June, but the delivery of the slate for the church’s roof has taken much longer than I had anticipated, with the result that the roof work has still not begun. Going ahead with the ceiling this September would mean at best doing both jobs simultaneously - or even more problematically completing the ceiling while the roof remained unfinished. So, I have decided to delay the inside ceiling replacement until June 2013. This means that we will not be moving out of the church and into the parish hall for the month of September, after all. That would have required a major community effort - originally scheduled for Labor Day morning – that now need not be done. Of course, the ceiling work is just being postponed and will still have to be done eventually, and the same community effort will still be required when that time comes! Imagine what he might say were he still alive today! Certainly it is increasingly characteristic of our “postmodern” time that it is not truth or falsity that matters but rather ideological credibility, the capacity to command social acceptance – not necessarily by everyone, but by those committed to a particular ideological tribe. And it is not a proposition’s falsity, but its incapacity to command such social acceptance that nowadays renders it no longer completely credible. We see this now all the time in the way competing claims are pitched to the public – their truth or falsehood being treated as mere social constructions of no ultimate significance. And so society subdivides into increasingly separate, particular ideological sub-cultures, each with its own presuppositions about the world and its supporting arsenal of supposed facts, the truth or falsehood of which is increasingly irrelevant. This defining feature of (post-rationalist) post-modernity is undermining the strategies hitherto employed back when the problem was just (rationalist) modernity - the fundamentally fragmented character of modern society with its fragile connections between individuals. Modernity has increasingly torn apart all sorts of social bonds, but until recently still presumed some common intellectual and moral framework within which conversation could occur and some social cohesion could be maintained. In 19th-century Europe, as the Church struggled to survive as an institution against an increasingly modern political order, it sought to counteract the social fragmentation associated with modernity and to reconnect increasingly isolated individuals into a community by preserving, repairing, or restoring traditional religious bonds. The way to do this, it was widely thought, was to assert the Church’s claims to authority as vigorously as possible and to insist upon its political privileges and institutional rights in relation to the state. The 19th-century United States presented this modern problem of social fragmentation in a way which was simultaneously more acute but also more moderate. As the most famous analyst of early 19th-century American society and institutions, the French nobleman Alexis de Tocqueville (1805-1859), observed (somewhat to his own surprise), the moderating factor in America was in fact religion. Disentangled from former political arrangements, religion in America was widespread and contributed to creating a kind of community capable of uniting individuals consistent with their freedom. How can religion still aspire to fulfill this role in a society in the process of becoming even more completely unglued, thanks to prevailing post-modern sensibilities? De Tocqueville and Hecker recognized how religion provided the glue a modern, free society required, but neither fully anticipated the present post-rational cultural context – a world where there are now many competing ways of being human, multiple and irreconcilable concepts of human fulfillment, whose credibility no longer depends upon a shared, traditional rationality. Traditionally, natural law reasoning has been central to the Church’s public moral language, enabling it to speak with plausibility to the wider world and to say something that is relevant to public policy in a religiously pluralistic society. Natural law, however, is about truth. As truth rapidly recedes as a contemporary cultural value, however, even that language loses its plausibility, leaving society with no shared or shareable tools with which to discern an intellectual and moral vision for what is authentically human. Media attention today has started speculating about the trajectory of Tropical Depression Isaac - whether and when it might become a hurricane and whether and when it might hit Florida's coast. As of this morning, Isaac was expected to strengthen to a tropical storm by the end of today and possibly be promoted to hurricane by tomorrow. It hasn't escaped anyone's notice that a certain political party will be holding its quadrennial political convention in (of all places) Tampa. In my opinion, planning an event anywhere near there at the height of hurricane season certainly seems to exhibit questionable judgment - if not outright hubris. There may, of course, be a certain irony in a convention containing a more than random sample of climate-change skeptics having to cope with a hurricane - in a warming world noted for an increase in the frequency and intensity of such severe storms. And, of course, some commentators wouldn't be able to resist recalling how many examples there have been in recent years of people blaming certain natural disasters on policies associated with their opponents. As if in response to such silliness, HBO's series The Newsroom's liberal news anchor said a few episods ago: "I'm a registered Republican - I only seem liberal because I believe that hurricanes are caused by high barometric pressure and not by gay marriage." In the Old Testament, the Lord did indeed inflict a pestilence on Israel in punishment for King David's sin of taking a census of his people (2 Samuel 24). In the New Testament, however, after 18 people were killed when the tower at Siloam fell on them, Jesus cautioned against making any explicit causal connection between a disaster and divine retribution. Instead, Jesus reminded his hearers that they all stood in need of repentance (Luke 13:4-5). Trying to draw explicit connections between natural disasters and other people's misdeeds can be tempting, but it is also imprudent to say the least and is more likely to discredit an argument than reinforce it. In 17th century England, for example, all sorts of calamities were publicly blamed on the supposed "atheism" of Thomas Hobbes, who, it is said, retorted that if his beliefs were to blame for those calamities it seemed strange that he had not been in any way afflicted personally! In this case, let's all just hope Isaac does his thing with minimal damage to anyone in Tampa or anywhere else! Every 3rd summer, The Roman Rite invites us to re-examine the special place of the Eucharist in our life as Christ’s Church in the world. It does this through the liturgical proclamation, over 5 successive Sundays, of the 6th chapter of John, commonly called Jesus’ “Bread of Life Discourse.” (This took place, according to John’s account, as a sort of spiritual follow-up to Jesus’ amazing miracle of feeding 5000+ hungry people with 5 loaves and 2 fish). The centrality of this “Bread of Life Discourse,” both in John’s gospel and in the Church’s official cycle of scriptural reading, highlights the Eucharist’s unique place in our Church’s life. For much of the Church’s history, the Eucharist was treated with tremendous reverence – so much so that most ordinary people received Holy Communion only occasionally, often no more than once a year. Medieval efforts to get people to communicate at least three times a year were unsuccessful, and the 4th Lateran Council (1215) finally settled on a precept requiring at least annual Communion at Easter. This situation changed dramatically (and, in the longer-term perspective of the Church’s history, somewhat suddenly) in the 20th century. The result is that receiving Communion is now seen by many as the ordinary thing to do at Mass. A key person in making this change happen was Saint Pius X (1835-1903), born Giuseppe Sarto, who reigned as Pope from 1903 until his death in the tragic opening weeks of World War I and whom the Church’s calendar commemorates today. Unlike many prelates of the period, Pius X came form a humble, ordinary background. He is supposed to have said: “I was born poor, I have lived poor, and I wish to die poor.” Besides the symbolic gesture of not promoting his family members to princely status, he practiced actual charity that mattered to people – for example, housing refugees from the 1908 earthquake in the Apostolic Palace while Italy’s secularist royal government dithered. Well grounded in the experience and needs of ordinary Catholics, he concentrated on the basics – catechesis and liturgy. The latter area was one where he especially left his mark - beginning with efforts to restore sacred music and eventually initiating the process of official liturgical reform, which would eventually be taken up by Pope Pius XII and the 2nd Vatican Council. His radical reform of the Roman Breviary mainly concerned the clergy, but his lowering of the age for 1st Communion and his vigorous promotion of frequent Communion affected the wider Church community and dramatically changed the ordinary believer’s experience of Catholic worship. This change was helped along in the 1950s and 1960s by radical revisions to the traditional fast before receiving Communion. For many centuries, one was obliged to fast from all food and drink (including water) before receiving Communion. This was intended to highlight the specialness of the Eucharist, its difference from ordinary food, and to foster the interior, spiritual preparation appropriate for so special a sacrament. In 1906, during Pius X’s pontificate, some very modest mitigation of the fast was introduced to permit the sick to receive once or twice a month. Then, in the 1950s, with the introduction of afternoon and evening Masses, the fast was radically reduced to 3 hours from solid food and 1 hour from liquids. (I was in 4th grade, and I remember what a big deal that change was). Finally, in 1964, the fast was further mitigates to the current requirement of a mere hour’s fast before Communion. This virtual disappearance of the traditional practice of Eucharistic fast has presented us today with the new challenge of how best to how to highlight the specialness of the Eucharist and to prepare ourselves spiritually to receive it. The apparent casualness with which almost everyone receives Communion nowadays has not gone unnoticed in some quarters. In an effort to re-inculcate some of the seriousness and reverence that seems perhaps to have been lost, some have even argued for a return to the traditional fast from midnight. Others, more realistically recognizing the value of afternoon and evening Masses in our contemporary context, have proposed a return to at least the 3-hour fast of the 1950s. There may be merit to that suggestion and to the concerns that seem to be motivating it. That said, there can be no doubt that one of the most significant benefits of the 20th-century liturgical reform for ordinary believers has been the encouragement to enter more completely into the Eucharistic experience as it was obviously originally intended to be experienced. And for that the Church and all of us owe Pope St. Pius X a deep debt of gratitude. Back in 1988, a good friend of mine explained how he was voting for George H.W. Bush for President because of his family background. His point was that, in the absence of other more especially compelling considerations, a candidate's character mattered most, and that the candidate's cultural and class background might provide the best insight into how we might expect him to act in office. My friend did not succeed in getting me to vote for his preferred candidate, but his argument was familiar enough - the ancient argument for aristocracy - which has had a long and honorable history and still has resonanaces even today. Aristotle (Politics, III, vii) famously identified three forms of good constitutions (monarchy, aristocracy, and "polity") and their three corresponding perversions (tyranny, oligarchy, and democracy). The difference among the three in each category is the number of those entrusted with ruling (one, the few, the many), while the difference between the categories of good and perverted constitutions lies in whose interest the governing is done. Thus, the three good constitutions all exemplify government in the common interest, whereas tyranny is one individual governing in his own interest, oligarchy is government in the interest of the rich, democracy in the interest of the mob of the poor. The aristocratic ideal of government by the well born, well bred, and well qualified has persisted into the present, even as traditional aristocracies were in decline. Its persistence was reflected, for example, in such modernized alternatives as Hegel's idealization of the royal Prussian bureaucracy as a "universal class." Marx turned that idea upside down and invested the proletariat with the aura of a new "universal class." In actual fact, however, the proletariat's leadership role gave way to such alternative variaitons of aristocratic elites as for communism the Communist Party and for socialism elite cadres of intellectuals, professionals, and government bureaucrats. Its persistence was also reflected in our American constitutional arrangements, which originally envisaged popular participation in voting for federal officials to be restricted to electing members of the House of Representatives. In Federalist, 35, Alexander Hamilton observed that "the learned professions," as he called them, "truly form no distinct interest in society, and according to their situation and talents, will be indiscriminately the objects of the confidence and choice of each other, and of other parts of the community." Since 1913 Senators are now popularly elected, and long before that the Electoral College had become popularly elected (albeit in a "winner-take-all" system in most states, which distorts the popular character of presidential elections in significant ways). Still the Federal Judiciary, whose members are all appointed and enjoy tenure for life, remains a a strong check on popular government in our constitutional system. (In the 19th century, the Supreme Court made it unconstitutional to do anything aobut the evil of slavery. In the 20th, it made it unconstitutional to protect unborn human life. In the 21st century, it has made it unconstitutional to restrict the political power of corporate money). Meanwhile, the ideology of "professionalism" infects society at all levels. To that, one might add the persistence of political leading families - Rockefelleers, Kennedys, Clintons, and, of course, our contemporary imitation of the Adams dynasty, the Bushes. In the Roman and medieval societies, a variant of the aristocratic principle was found in the Catholic Church. In fact, many prelates actually arose from the secular aristocracy and exemplified some of the best of secular aristocratic values, but the law of clerical celibacy guaranteed a non-hereditary ecclesiastical aristocracy and thus necessitated a broader openness to new members from other social classes. While the hereditary principle has not completley disappeared (as again our own politcs amply illustrates), most modern elites followed the Church in recruting members more meritocratically - e.g., the financial, professional, and academic elites that now set the tone in Western capitalist societies or the revolutionary parties that have replaced traditonal aristocratic elites in non-Western societies. Like Aristotle, the American founders recognized the moral limitations of most forms of governance and opted for the mixed constitution model. There is, however, only so much institutional arrangements can guarantee.The perennial appeal of aristocracy derives, I suspect, from our recognition that, while while no governing class can ever be completely trusted to govern solely in the common interest, the personal and collective public spiritedness which is central to the ideology of aristocracy (and which is easily over romanticized) remains a value, the loss of which continues to impoverish our social and public life at a deep cultural and moral level. And that may be why it is gettign harder and harder even to conceptualize a common interest. La paciencia todo lo alcanza, said the great 16th century Doctor of the Church, Saint Teresa of Avila - perhaps one of the strongest arguments for patience that one is likely to hear. In theory, of course, I'm all for patience. I preach about God's patience toward us, and certainly imitating God's generous way of treating us is always a good norm to follow. And I find I have become sufficiently accepting of my own and others' limitations as to be ready to put up better those who may try my patience. I suspect it may be one of the calming benefits of aging, but I've certainly learned over the years to restrain the inevitable impulse to respond impatiently in challenging situations.Certainly being a calmer more patient person appears on balance to make the stresses of life more endurable. Other factors also affect how we feel about waiting - uncertainly, for example, which is precisely what we are so likely to experience a lot of at airports or in traffic or waiting for a job to get done that we've contracted. "Uncertainly magnifies the stress of waiting, while feedback in the form of expected wait times and explanation for delays improves the tenor of the experience," Stone explains. That's certainly true, but I think only in part. Even when one knows the reason, waiting is an unpoductive reminder of one's personal powerlessness. No matter what the reason, that can be painful. There is also, Stone suggests, a fairness factor. When on line, for example, people expect the order of the line to be respected and resent it when it is not. (Hence, my frustration when in certain other countries where people do not seem to share this notion). A particularly egregious variation on this theme, I believe, is all the special statuses which now determine the order of boarding an airplane. It used to be (with certain exceptions) that planes boarded from the rear. You knew when you got your seat number approximately when you would board. Presumably the reason for that system was to minimize bocking the aisles as people got settled and stowed their carry-on luggage. The old system was thus more efficient - and hence faster. Now, with all the various privileged statuses, not only has any semblance of a fair order dropped out of the boarding process, but the process has been made less efficient (and hence lengthier). If nothing else, it has become a good metaphor for our increasingly unequal and less fair society. According to Stone, "Americans spend roughly 37 billion hours each year waiting in line. The dominant cost of waiting is an emotional one: stress, boredom, that nagging sensation that one's life is slipping away." Surrounded on all sides by so much bad news, the world has been treated these past two weeks to some diverting fun in the form of the London Olympics. Our contemporary Olympics is, of course, a thoroughly modern media spectacular that has actually little in common with its ancient namesake, but its name at least reminds us that there was once an ancient world so totally different from our own. In that world, where the stories of the gods were an important part of daily life, the Olympics were an overwhelmingly religious festival, organized around the offering of sacrifices to the Olympian head-god Zeus. And, in that world where the stories of the gods were an important part of daily life, ancient Greeks and Romans would all have known the story of the god Apollo’s birth - how a dragon had pursued his mother in a pre-emptive attempt to eliminate him, how his mother found a safe place to give birth, and how the newborn god soon destroyed the dragon. In the first century, the Emperor Nero posed as a new Apollo. (Nero competed in the Olympics - and was declared the winner despite the fact that he failed even to complete his event). The early Christians, however, had their own alternative version of the story, from which we just heard in today’s 1st reading [Revelation 11:19a; 12:1-6a, 10ab]. The child destined to rule all the nations was not Apollo, of course, but Christ. The Christian version of the story expressed the hope in the future that is fundamental to Christian faith. But in the actual world of now, in which death always appears to have the final word, what we hope for appears at best as a hope, at worst just a wish. But the wish has been transformed into hope by Christ, the first of all the human race to be raised from the dead [1 Corinthians 15:20]. Jesus Christ is indeed, as Saint Paul teaches, the new and definitive Adam. On this basis the 2nd Vatican Council reminded us that in Christ is to “be found the key, the focal point, and the goal” of every human being “as well as of all of human history” [Gaudium et Spes, 10]. 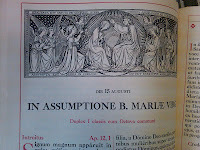 What we celebrate today, the Assumption of the Blessed Virgin Mary - the ancient belief of the Church “that the Immaculate Mother of God, the ever Virgin Mary, having completed the course of her earthly life, was assumed body and soul into heavenly glory" [Pius XII, Munificentissimus Deus] – represents one further step towards the final fulfillment of God’s great plan for the human race. In the Old Testament, the Ark of the Covenant was where God dwelt directly with his people. Both Mary and the Church are arks of God’s new covenant. Mary is already with God and can be seen there with the eyes of faith by the Church, which fervently hopes to follow her there, even as we strive to imitate her here and now. On earth, Mary linked Israel and the Church. Assumed into heaven, she now links the Church as we now are and the Church as we then hope to be. And so today the Church exults with Mary in praise of what God, through Christ, has already done for the world and is continuing to do. Today the Church exults with Mary in proclaiming the greatness of the Lord, who, in exalting Mary, has shown us our future – his promise of mercy, the promise he made to our fathers, to Abraham and his children forever [Luke 1:55]. 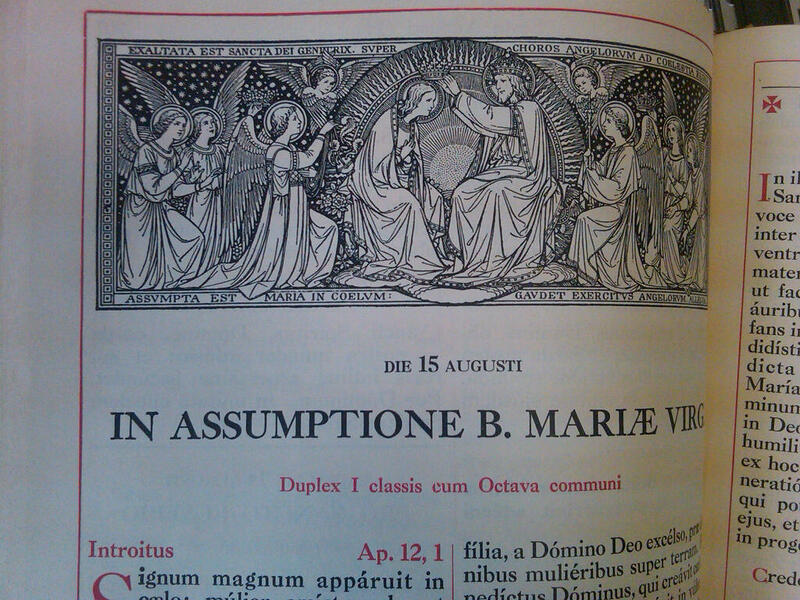 Homily for the Solemnity of the Assumption of the Blessed Virgin Mary, Immaculate Conception Church, Knoxville, TN, August 15, 2012. O God, in whom we live and move and have our being, grant us sufficient rain, so that, being supplied with what sustains us in this present life, we may seek more confidently what sustains us for eternity (Collect, Votive Mass for Rain). While so much of the country suffers a serious and really very destructive drought, here we keep receiving a regular supply of rain. Rain is good. Without rain, we would die. Both where I came from and where I live now, rain is normal - a perfectly predictable part of the regular fabric of life, and not (as in some climate zones) confined to winter or some other specific season. Unfortunately, summer rains here have a tendency to come in the form of thunderstorms. Rain is necessary and good, but lightening is less so. That's especially so where it frequently leads to downed power lines and hours - or even days - without electricity. (Oh, the wisdom of urban planners who put power lines underground!). Thunderstorms also wreak havoc with air travel - as I experienced to my horror last year when I was trapped overnight at D.C.'s Dulles Airport. And, of course, in the worst-case scenario, thunderstorms can also spawn tornados - nature's single most destrucitve form of weather. Admittedly, rain can be destructive, but rain remains life-giving - and can as often as not be be gentle and refreshing. It is no accident that the Old Testament calendar commences in autumn, when the life-giving rains return to refresh the parched desert climate after the scorching summer. Somehow, we inherited some of that mindset - as reflected, for example, in the traditional autumn start of the school year. My memory may be selective, but it seems to me the first day of school was often rainy when I was growing up. (Perhaps, my memory is influenced by having begun school one year during Hurricane Donna!) Here, while we don't wait till autumn to begin school, we at least had a rainy morning for the opening of school today. A refreshing start to another school year! Since JFK’s historic breakthrough in 1960, only one Roman Catholic (John Kerry in 2004) has headed a national ticket. So politically “normal” has Catholicism become, however, that, since 1964, seven running mates have been Catholics. First, the Republicans nominated William Miller (with Barry Goldwater) in 1964. Then, the Democrats nominated Ed Muskie (with Hubert Humphrey) in 1968, Sergeant Shriver (with George McGovern) in 1972, Geraldine Ferraro (with Walter Mondale) in 1984, and Joe Biden (with Barack Obama) in 2008. Now in 2012, the Republicans are set to nominate Paul Ryan (with Mitt Romney). So 2012 will see a Catholic VP candidate on each party’s ticket. (Also, for the first time ever, neither candidate on the Republican ticket will be a Protestant). All of this has little to do, in my opinion, with courting some real or imagined Catholic voting bloc. It reflects rather the reality of what I call the political “normalization” of Catholicism. This “normalization” is also reflected in the other branches of our government. Catholics (who constitute approximately 24% of the national population) are 29% of the current 112th Congress (156 of the 535 senators and representatives), and include both the Speaker and the Democratic leader (and former Speaker) of the House. Six Justices of the U.S. Supreme Court are Catholics. (And there are now no more Protestants on the Court). Demographically, Catholics are a good electoral barometer - not because they vote as a bloc but rather because they represent the country so well. Not only do they represent a quarter of the national population, but unlike many other denominations they effectively span the entire socio-economic spectrum. That is what makes them – and, by extension, the “Catholic vote” – so representative. That does mean, however, that the more explicitly religious dimension to this phenomenon of Catholic political prominence gets lost in the discussion. This concerns not demographic voting patterns but rather the Church’s public presentation of itself as a moral voice (and hence a political player) in American society. Unlike some more sectarian religious bodies which aspire to avoid active engagement with secular society, the Catholic Church has historically seen itself as having a responsibility to form citizens’ and statesmen’s consciences according to the principles of the natural moral law. One result has been an accumulated body of principles commonly called “Catholic Social Teaching.” The U.S. Catholic Bishops have identified seven key themes at the heart of this tradition. These include the defense of human life and the dignity of the human person (opposing such intrinsic evils as abortion and euthanasia), a commitment to community (recognizing marriage and family as central social institutions), the reciprocal relationship of individual rights and responsibilities to society, a special priority for the needs of the poor and vulnerable, emphasis on the dignity and rights of workers, national and international solidarity, and care for the created world including stewardship of the environment. What part, if any, do these principles play in the political choices of Catholic citizens and policy-makers? On October 11 in Danville, Kentucky, there will be a 90-minute debate between the two VP candidates. Imagine instead of the predictable exchange of slogans and soundbites a debate focused on the above principles and on whether and how to implement them in practice in the United States! There are times in life when nothing seems to go right, despite all our best efforts. We try our best, but it just isn’t good enough. Too much is being demanded of us; too much expected of us. We get worn out and want to give up – just like Elijah in today’s 1st reading [1 Kings 19:4-8]. Elijah was the most remembered prophet of the Old Testament. He appeared abruptly - as if out of nowhere to resist the corruption of the Northern Kingdom whose King, influenced by his pagan Queen, Jezebel, had corrupted Israel’s religion with worship of the foreign god Baal. Most of us don’t lead such significantly public lives. So our own episodes frustration and failure seldom seem so dramatic. Occasionally, the feelings of otherwise ordinary un-public people sometimes spill out in public - even erupting in violent acts such as we have witnessed twice in recent weeks At the other extreme, some try, with greater or lesser degree of success, to keep such feelings behind a defensive wall, in an attempt to insulate both themselves and society from their effects. In between these extremes, feelings of frustration and failure frequently spill out in bitterness, fury, anger, shouting, and reviling – malicious behaviors, which Saint Paul [Ephesians 4:30-5:2] said grieve the Holy Spirit of God. In contrast, Paul instructed the Ephesians to be kind to one another, compassionate, forgiving one another as God has forgiven you in Christ. Of course, that’s a lot easier said than done! So how does one get from here to there? Ready to give up, Elijah fell asleep under a broom tree. Awakened by an angel, he found the nourishment he needed and which he would not normally have expected to find there in the desert. He should have recognized that as a sign that help was on the way. So depressed was he, however, that even after eating and drinking, he fell asleep again - only to be wakened and fed again. Apparently, Elijah was ready to give up on God, but God was not willing to give up on Elijah. God really was demanding a lot from Elijah. Hence, God’s unwillingness to let him give up, and hence also his readiness to accompany Elijah on the way, personally providing him with what he would need. None of us is Elijah, of course. Yet God does expect results from each one of us as well. We too may feel at times as if too much is being expected of us. After all, who can really be expected to be kind, compassionate, and forgiving – especially when it seems to produce few if any results? Just as God was prepared to accompany Elijah and personally provide him with whatever he would need, he does the same for us on our own difficult, tedious journey. As Saint Paul has reminded us, Christ loved us and handed himself over for us as a sacrificial offering to God. Paul’s reminder is always timely – but never more so than in those times and situations when we too feel discouraged and are tempted to give up. As we have been hearing now week after week [John 6], the Eucharist is the visible food Christ gives us for the journey – our life-long journey out of the desert of bitterness, fury, anger, shouting, and reviling to the mountain where, having experienced for ourselves God’s kindness, compassion, and forgiveness, we can at least begin to become people of kindness, compassion, and forgiveness for the world. I think I probably read less now than I once did, but I probably still read too much. Even so, there are definitely a number of gaps in my reading, and the famous atheistic philosopher Ayn Rand is one of them. I have never read anything she wrote. In the late 60s, I was very briefly an object of some sexual interest to an Ayn Rand disciple I was superficially acquainted with. But I never responded to those overtures and never acquired any motivation to read or even learn much about Ayn Rand. Ayn Rand has been very much in the news this year, however, as the purported favorite philosopher of Wisconsin Congressman Paul Ryan – as of today Mitt Romney’s running mate, to be officially anointed as the Republican candidate for V-POTUS at the party’s convention in Tampa later this month. Whatever one thinks about Paul Ryan’s ideas, the interesting thing is that he has them. Until today, this has been a campaign completely bereft of such. While the media focus almost exclusively on trivia (“gaffes”), the two candidates’ campaigns have concentrated on reinforcing the dogmatic certainties of their respective bases. Paul Ryan as VP nominee will not end either the candidates’ catering to their narrow niche markets or the medias coverage’s commitment to silliness, but it does – for any who might be interested – definitely demonstrate that, for all its boring inanity, this really is an election in which the choice is between competing moral visions of human nature and society. Mitt Romney largely comes across as an extremely wealthy man who unsurprisingly seems to exemplfy the orientation of his class that society should be organized for the primary benefit of the very wealthy. In Paul Ryan, however, his campaign now has acquired a genuine system of philosophical principles. Whereas Romney himself has thus far confined his programmatic proposals to vague generalities, the same can hardly be said about his running mate, who is the author of one of the most radical budget plans in our nation’s history. (If the Democrats play this right - something they don’t always seem to know how to do - they should be able to exploit Ryan’s proposals on Medicare, etc., as the gift that just keeps on giving). If nothing else, this lackluster and utterly uninspiring campaign just became perhaps a little bit more interesting – certainly not inspiring but at least interesting. It’s August, traditionally the most oppressive month of the summer. Presumably that explains why in much of Europe the vacation (“holiday”) season is commonly associated with August – for example, ferragosto in Italy. In much of the United States (and Canada), Labor Day at the beginning of September has traditionally marked the end of the summer vacation season. In contrast, at least in the part of the United States where I now live, school starts next week, just barely even mid-August! In the past, if I’ve looked forward to August at all, it was because it meant July was past and September was on its way. And the August heat would be balanced a bit by the perceptible daily reduction in daylight and the hope that autumn is actually around the corner. In parish life, I welcome the “return to normalcy” that traditionally accompanies the start of another school year. Even so, doing it in the August heat still seems somewhat counter-intuitive to me. But it may perhaps be somewhat symbolic of the increasingly hotter future that seems to lie in store for us, as summer becomes the new normal. Wildfires, drought affecting some 64% of the continental U.S., and this summer’s record-shattering heat have highlighted what scientists have been warning us about for years. The climate is changing. The world is warning. And the results – rising sea levels, more severe storms, breadbaskets turning into dustbowls, excessive demands for electric power, and the energy-sapping, mind-numbing, killing heat - are disastrous. To date, there is, of course, little evidence that our political leaders are at all willing to face up to all these dangers and actually attempt to do something serious, so as to leave future generations a world still worth living in. It is, one must concede, one of the inherent shortcomings of electoral democracy that it discourages leaders from planning for the future, rewarding instead sound-bite sloganeering that panders to people's present preferences. There are undoubtedly powerful vested interests with a stake in maintaining our climate-destructive way of life. But we have all been accomplices in this process. Every time one turns up the air-conditioner or drives a car, one contributes to the climactic crisis we are already experiencing and which will progressively push the planet closer to an abyss. It remains to be seen whether we can actually come to grips with the causes and consequences of our warming world and change course sufficiently to bequeath a better world for future generations. Meanwhile, summer gets longer, while the world gets hotter. Alfred E. "Al" Smith (1873–1944), a three-term Governor of New York was the Democratic presidential candidate in 1928. He lost by a landslide. It was a period of national prosperity - and Smith was a Roman Catholic. Being the first Catholic presidential candidate of a major political party has given Smith a permanent place in American Catholic history. His defeat – and the anti-Catholic hysteria his campaign provoked – remained a sinister specter in presidential politics until John F. Kennedy’s successful win in 1960. Since 1945, the Alfred E. Smith Memorial Foundation Dinner on the 3rd Thursday of October each year is the Archdiocese of New York’s premier charity event, raising millions of dollars for Catholic Charities. Since Eisenhower, every President but one has spoken at this high profile Catholic event. In 1960, candidates Kennedy and Nixon both spoke. Since 1976 the two presidential candidates have attended the dinner more often than not - in 1976, 1980, 1988, 2000, and 2008. Thankfully, that valuable tradition will continue this year with President Obama and Mitt Romney. In extending this invitation, New York’s Archbishop Timothy Cardinal Dolan, has continued an important American Catholic example of institutional engagement with secular society. Al Smith, whose whole life combined unapologetic Catholicism with an active political career would surely approve. Neither of this year’s candidates is particularly attuned to Catholic concerns and sensibilities. Neither are the parties, both of which have largely lost touch with their historic principles and with some of the most fundamental facts about human nature and society. In such circumstances, it is easy to withdraw from engagement – precisely when engagement is so critical. Back in 1977, sociologist Peter Berger (Facing Up to Modernity: Excursions in Society, Politics and Religion) warned that “to go on proclaiming the old objectivities in a social milieu that refuses to accept them, one must maintain or construct some sort of subsociety within which there can be a viable plausibility structure for the traditional affirmations.” That is precisely what people of faith are experiencing today, as society subdivides into separate entities each with its own presuppositions about human nature and society. Of course, people of faith are a sub-society of a sort. But one of the defining characteristics of a Catholic self-understanding has been an aspiration to talk to society, to partner with the world. In itself, inviting the candidates to the Al Smith Dinner is a small matter – more symbolic than substantive. But symbols speak. And this symbol speaks to the conviction that Church and society need not oppose each other in irreconcilable conflict, but need to speak to each other. But to do that we will need to relearn a once common language about human nature and society.